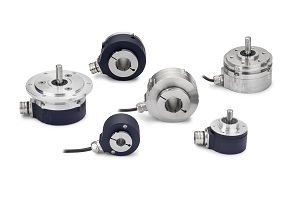 The new functional safety incremental encoder range from BEI Sensors is certified by TÜV Rheinland and provides the most complete safety encoder offering on the market today. These encoders can be used in the highest industrial safety related applications up to SIL3/PLe Cat. 4, and are mechanically and electrically designed to safety standards EN ISO 13849-1, IEC/EN 61 508, and IEC/EN 62061. The range is offered with a standard Sine/Cosine analog electronic output or an industry-first for safety encoders; a digital (TTL or HTL) electronic output. Seven distinct encoder models are available with options to fit a variety of installations. These choices include 58 mm or 90 mm body sizes, shafted or through shaft styles with cable or connector terminations, resolutions up to 2500 PPR, and a selection of shafts and bore sizes. This product family has aluminum encoder housings for most standard industrial applications, or optional stainless steel housings to withstand harsh outdoor or washdown environments. High ingress protection ratings are available up to IP69K for high pressure and high temperature washdowns. Safety applications with BEI Sensors products are as simple to implement as any other standard industrial installation. The functional safety encoder range is backward compatible with non-safety related encoders, making it easy to upgrade existing installations. For more information on the new range, to download the BEI Sensors SISTEMA product library, or to view a white paper on functional safety, visit www.beisensors.com/safety. BEI Sensors will feature the Functional Safety Encoders at SPS IPC Drives in Nuremberg Germany, November 25-27, (Hall 4A, Stand 535). Visitors are invited to explore the new encoder range and speak with a product expert to learn how BEI Sensors can help with any new or existing safety requirements.